The Lory-link was created in July 2000 when a group of Lory lovers in New Zealand decided to get together to discuss various issues concerning Lories and Lorikeets. 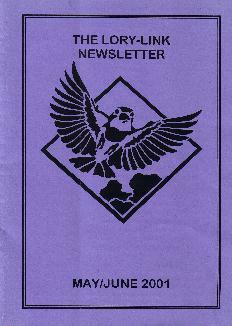 After the first few meetings a bi-monthly newletter was produced and during the summer months further meetings and outings were arranged at different Lory breeder's homes. 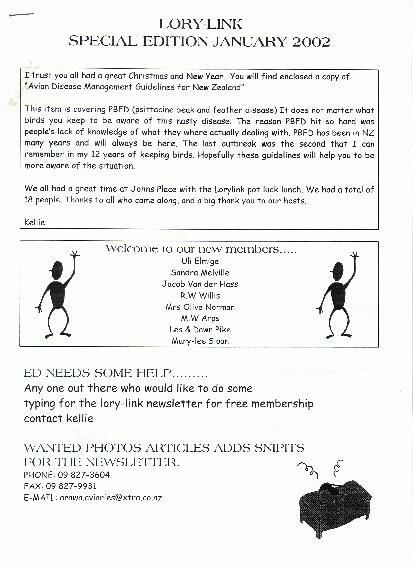 Lory owners were also encourged to join the Lory-Link and at meetings many issues were discussed often leading to articles for the newsletter. 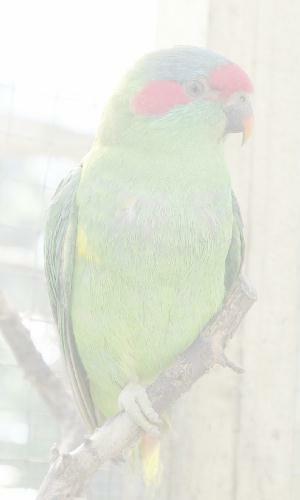 Many of those initial members of the Lory-link are listed in the breeders pages on this web site. The Lory-link was created in July 2000 when a group of Lory lovers in New In late 2000 an internet mailing list was started as many interesed people had internet access but could not attend meetings. This also allowed a wider group of overseas people to participate and now the list has many contributors especially from New Zealand and Australia, with others from USA and Canada. The Lory-link was created in July 2000 when a group of Lory lovers in New From mid 2001 the design for a Lory-Link web site was started with Michael Baxter taking on the onerous task of designing and implementing the first version. This was made available for testing in early Decemnber 2001. Many suggestions for new features and updating the web pages were received in the first few weeks and very soon over the holiday period into January 2002 a major redesign was underway with more contributors adding bird images, web pages and other new features. This work is still continuing and will probably be an ongoing task well into 2002. - oppose the New Zealand Government view that Rainbow Lorikeets are an unwanted organism in New Zealand. With our web site we hope to build on the success of our local newsletter and mailing list, this site allows us to further our aims of promoting Lories and Lorikeets. The Lory-Link is the first Lory and Lorikeet based group in New Zealand and we are very proud of this. Hopefully you will eventually find most things you need to know about your lorikeets on this web-site. We are expanding this site with new information on a regular basis. If you have any suggestions of any type or can contribute anything to this site then we would love to hear from you. If you have a particular enquiry about any subject concerning lories then please leave a message in the message forum. The Lory-Link mailing list is available for anyone to join. Like most specialised mailing lists it has a very high proportion of 'on-topic' discccussions relevant to Lories and Lorikeets. It is also an excellent way of getting advise and general information on all aspects of these birds. This list also includes some regular postings of Lory pictures, for sale and wanted messages and occasionally information about other birds. If you would like to chat with us via e-mail come and join some of the members from The Lory Link; group at Yahoo. The Lory-Link newsletter is produced bi-monthly. It usually contains several articles provided by Lory-Link members and sometimes articles reprinted (with permission) from other publications and web sites. These articles will appear on this web site sometime after the newsletter is distributed. 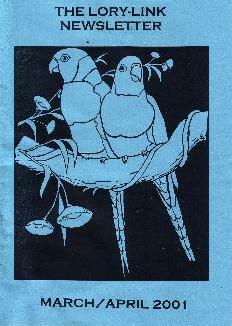 Articles in the past newsletters have covered issues from diets and feeding, health and welfare concerns, diseases and treatments, aviaries and cages, lory toys, and descriptive details of different types of Lories and Lorikeets. Notices of meetings, outings and other organised events are included. There is a for-sale and wanted column for members and advertisments from local suppliers of everything necessary for the Lory owner and breeder. Most of the articles previously published in various issues of the newsletter and several contributed to other publications have been reproduced in the articles section of this web site. Some articles have been enhanced with the addition of bird images. The Lory-Link web site is hosted by KC Internetworks in Auckland, New Zealand. (kc.net.nz). It runs on a Sun Ultra server system. The redesign of the web site was untertaken by David Dix who built on the original design created by Michael Baxter in late 2001. The site has expanded to offer many more sections of information plus additional articles, photographs and new features such as the guestbook, message forum, MPEG movies/sound files, For sale, Services, Feeding, Aviaries and Lories sections. We intend to try and continually update the site and offer the best and most timely information available on Lories and Lorikeets. As a specialist topic web site the Lory-link has a quite low access rate - ie number of hits. We average between 400 and 500 hits per month, the best month was just over 1000 and the best daily total was 442. By October 2002 the hit rate had increased to over 850 per month on average. There are many one-time visitors and a small number, under 100, of regular repeat visits on at least a monthly basis. It is probably unlikely we can improve much on these figures without some form of advertising or seeking publicity. Awareness of our site is slowly growing and hits-figures slowly increasing. Although the Lory-Link is mainly a New Zealand based group of lory enthusiasts it is open to anyone to include articles, contributions, photographs or MPEG video clips on the Lory-Link web site. IF you would like to contribute something to our site then please email us the details. We would be very pleased to hear from you. Please also sign our guestbook and let us know what you think of our website. Any suggestions for improvement or corrections would be welcomed. If you are looking for specific information and cannot find it in the pages of this web site then you could directly email us (see CONTACT info above) or leave a message in our Lory message forum (a menu option in the Lory-Link home page). There are many Lory enthusiasts associated with the Lory-Link who would enjoy discussing any aspect of this interest with anyone else. Last modified: 31 October 2002.